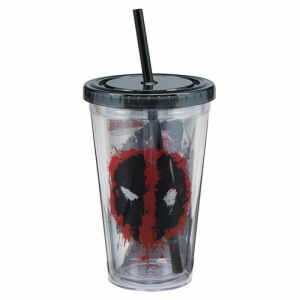 We have Just Sold out of Deadpool 18 Ounce Acrylic Travel Cup. Not to Worry! Fill in the Notify me When Available and you will be the first in line for our restock of Deadpool 18 Ounce Acrylic Travel Cup !! From the Deadpool collection by Vandor. Deadpool 18 Ounce Acrylic Travel Cup. Double wall acrylic travel cups come with a straw and are BPA free. These double wall Travel Cups keep drinks cold! Hand wash recommended. Vandor Deadpool Coffee Mugs shipping from Canada. No Surprise Border fees or Customs!